Created by Illclan Animation Studios (www.illclan.com). Meet the wonderful designers behind your favorite hairstyles in Second Life! We hope to see you at Hair Fair 2009, running June 20 – July 4. Search “Hair fair” in Second Life to find us! We all were new someday in SL. Also beside even explore places at first time, we got our first shopping once, even if it was a freebie. – Merchants also participates in Groups. Hunts/Malls/Fashion, etc groups generate notices. They can disable it but it´s not an obligation, if they desire to have the news from the other people. Notices is stated as like normal IMs , resulting the mass capped message that will be on the creator´s box. – Greeters that send green texts to the owner – (AKA traffic stats bots) wich send to the merchant´s mailbox a list of people who have recently visited his place, in every minute. This mass message may up ending capped messages too. – Worried Customers trying to contact the Merchant: People stay calm. The most secure way to contact the merchant is only sending them a notecard. Instant mass IMs may up not appearing at his viewer and some cases doesn´t even go to the mailbox. Don´t blame us if you just send Instant messages and end up not getting any response. It´s not that we are avoiding it, it´s just really we don´t receive AT ALL. – Try always to add your issue on the TITLE LINE. If possible with your avatar name, to rapidly contact you. Most of “New Note” notecards end up confusing us and not having the properly priority. When we see it´s a serious issue we try to get online soon as possible, if not we just wait for the time we get able to connect. And some people doesn´t even read because they might think it´s mall invitation notes. – If you can´t find the item you bought: Try always to use the INVENTORY SEARCH form on the Inventory window. Look up for the name of the item you bought, and if it was recent, you can look up on the “Recent Items” tab. – Some people are lazy to create their own notecard and rewrite inside of other avatar´s notecard and send it to the merchant anyway, with no title or identification. and may end up we getting contact with the wrong person. That´s why we ask for your SL name on the NC title. -If you are looking for simple scripts, you may have a look on the Official Second Life Forums or SL wiki, you may up finding them for free instead of paying much for an item that you can get for free. – Be Respectful no matter what the situation is. As we aren´t on face to face, we always want the best for our customers, don´t assume the worst happened, give the merchant one or two days to contact you back before you get on nervous. As you may know, we all do have a Real life and sometimes things may gets us in surprises. There are some few tips to have a hapilly and safely shopping in sl, in world or online, trying to following them you may get the things sorted out very easily with no confusion at the end. I am sure lots of merchants wants to express everything like it´s written here but in our profiles we don´t have much space for it, so don´t think when we say “send your issues by notecard” or something like that, we don´t want to be rude or arrogant. We want to help you, just help us too to reach you in the easy way. Sculpt users addict : Tip about LOD sculpted prim! Do not be taken in by Sculpty Myths! Sculpted prims are now a huge part of Second Life’s Abilities to Create! Then this tip is the Amazing Fix to that! use up all your resources. Debugging your LOD settings is something that can and will make all your sculpts hold the intended detail better. 1. Show the “Advanced” menu with Ctrl-Alt-D, or Opt-Ctrl-D on a Mac. 2. Select “debug settings” near the bottom. You can thank the wonderful Vendors on xstreet for this trick. I saw this tip and had to spread it to the world! 4. The recommend setting it as high as 4 to get all your sculpts looking as the maker intended. Freebies: Do they help generate interest at your business? How do they help generate interest at your business? Does your customers when gets freebies out from your store, do they return to see your products? Do they im you to say that they are very satisfied with your free item that got interested to see more about yor store? Or they just get, leave and no more you hear of them ? Well this subjects is well divided. It really depend on Kind of freebie we are giving out. Some freebies has limited features that works (gadgets, HUDS)… that turn out interest in people to get know more about this and maybe purchase the full product of you. That´s a great advantage of adding your DEMO products to buy for 0L not 1L (I don´t call products sold for 1L as freebie, as this isn´t really for free), and the other vantage that count much, is adding a freebie that WAS REALLY MADE BY YOU, NOT GOT FROM A FREEBIE RESELL. Really, unique freebies, more people can have some idea of your products quality and it will turn in interested at your store more. We are so sick to see places giving out freebies that are really out of time, it´s just that i don´t think old freebies are good, but INOVATING them, gives more motivation to your customers to return at your place. New things are GREAT sometimes. Specially with clothes. Giving out freebies can or can´t be connected to your sales. It really depends on the way you give out a freebie. New stuff generates interest from everybody. Make them return to your store. It worths. I find myself often looking at items and images posted by new designers and thinking that they´ve got a solid design or item to sell, but they are not showing it off and marketing it to the fullest potential. Figured since I´m thinking this way. There have to be others who feel and think the same way. So, I´m starting this thread as a way for those of us who have been selling for a little while to offer tips and advice to those who are just starting out. If you don�t want to help out.. then simply ignore this thread� if you have any words of wisdom or thoughts.. post away. Tip #1: Name your business. If you have a memorable business name, word of mouth will spread. Think about it if someone is wearing your item and someone asks where the got it from.. they are more likely to remember the store name over your name. It makes it easier for people to talk about your shop. It’s also advisable to have a logo, people respond to visuals and most the shops in game that are among the most popular have logos that you see and know it’s them right away. Tip #2: It´s all in the name. If you make a shoe and call it Blue Shoe then it´s not going to be something that sticks in the memory of those you want to buy it. Come up with something catchy. Tip #3: Have a Studio. You don´t need a large building; just somewhere that has a controlled environment. It´s easier to take photos if you can control what´s around you. Tip #4: When photographing your item, use LIGHT. If you don´t have a studio lighting set up, don�t worry the sun works great to. Use the game settings to control the sunlight. Depending on which way your facing, I find that either sunrise or sunset works the best so you have direct lighting. Tip #5: Use Prt Scr. Instead of taking pics in game with the screen shot tool, use the camera controls to line up your shot and then hit the Print Screen button. Then paste the image into your art program. This way you can work out the exact angle to show the product off best without the $10 fee every time you take the pic. You can also use this to get multi shots of the item from all sides and edit them together in your art program. Then, you simply upload the file for one $10 fee. If you do make sometihng that the market already has lots of and price it high – then people will not only look elsewhere for that particular item – they will also start to associate your name with “expensive” and avoid you. Get a solid satisfied customer base before looking at millionaire alley. Tip #9 : Give SOLID after sales service – If a paying customer has a problem with one of your products don’t just say ” read the instructions” . Drop what you are doing and take time to talk them thru the instructions – use the conversation to write better instructions. ( If you havent the time – get back to them and let them know you will contact them to sort it out ). Not everybody knows SL as well as you – and nobody knows your product as well as you – it may seem obvious to you, but if they are IM’ing you then it isnt obvious to them. If you help people out you get a rep for being helpful and people WILL take a chance on a product knowing that there is someone there to explain it – instead of saying “woah – not going to touch that – sounds way too tricky” . Tip # 11: I’m sure everyone has they’re own tastes, and I haven’t built much of anything, (if nothing,) But as a buyer this is something I’ve noticed. If you’re making a vehicle, MAKE IT COPYABLE! Everyone KNOWS that, due to lag, or sim crossing, your vehicle will (and most likely) will go off into the ground and either 1. get away from you, 2. Make you crash and you may never get it back. I can’t emphize how frustrating it is to buy a really nice vehicle of HIGH price and then not have it anymore. Thats great that you’re allowing people to buy this as a gift, but come on! Think about it, what good is a gift if you fear loosing it? And not just vehicles, followers too. Tip # 12: Everyone is unique. So just because your product is “one of a kind” doesn’t mean that you shouldn’t allow it to be modifiable. Avatars are a major here, Some avatar makers do not allow Mod at all, meaning either A. they have many features that allow it to be customized, B. The avatar is the same for everyone! No one likes to be the same, so think about it. If your avatar is no mod and no scripts, then guess what? You will not get many sales. Specially if the avatar is full prim. That leaves you with no way of adding jewelry or accessories to your avatar. Which means, you’re going to see MANY of the same identical avatar, or you will see very few. 1. Say your customer suddenly IMs you asking for a copy of the item. When asked why, the customer replies that he/she tried to modify the item and messed up. People who are new to building (and people that are pros even) are bound to mess up on new ideas! 2. Something happens- the sim crashes and the avatar caught in the crash suddenly has a messed up avatar! (that happened to me once.) They will then ask you to A. fix it, or B. ask for a new one! Thats bad for your bussiness and for your customers! Your customer is unique in they’re own way and so should your products! If they are wanting your items but have slight modifations they would be willing to preform, Its nothing against you, its just they would like to stand out and be reconized! And also, if a customer does an EXCELENT modification, they’re going be reconized will be asked where they got it! So guess what? They’re HELPING your business! This isn’t really a tip, but, make 2 vendors, 1 with permissions, and the second without the permissions! That way your customer has the option to get either/or so they can do as they please! Tip #14: ALWAYS be willing to help your customer. Even if they are rude, and just don’t get it, (I work for a music company in RL, so you’re BOUND to get those customers,) try to be as helpful as you can! They can be frustrating, but just remember one thing: You’re customer may have “special needs” and may take some time to help. The more you’re willing to help, the more you’re showing good business. Tip #15: If you deal with transparencies in your designs… whether in clothing or any other item… learn to eliminate ALL white halos between the graphic and transparency. I have several pieces of clothing that I really like the style of… but.. rarely wear because I can see that white fringed hallo at the bottom of a jacket. Tip #16: For clothing designers… make your front and back seams match. Do this for sleeves also. Search the SL Forums until you find Chip Midnight’s clothing templates. Use them. Tip #17: For a finished outfit’s texture. Do Not upload and use 1024×1024. SL will automatically resize and display it to 512×512 so using a larger size just slows your texture load in. Tigress has a couple outfits that I’ve never seen because even after a couple sessions of SL… the textures still haven’t loaded… LOL! If youmust work at 1024×1024… reduce a copy for upload to 512×512 and “lightly” use the UnSharp Mask filter in photoshop to off set any blur introduced by reducing the file. Tip #18 :Make sure that your description is informative and well written. Without seeing a good description of the items (and decent pics, handled above in tips 4, 5 and 17), I am very unlikely to buy it. Particularly for items that require instructions, give your potential buyer some specifics about how it works and why it is value-added. And try to be reasonable with the “adspeak”. Talk up the item without making outlandish claims about how good it is. If it is truly THAT good, then give some evidence instead of simply saying so. For example “on the Most Popular list for the last 4 weeks…” , “over 200 sold on SLX”. Or quote a buyer review. Say what the item does/is first, in simple terms. Then, go on to give specifics. Buyers who are interested will read on, and those who are not will move on. And for goodness sake, use a spell checker! (Hastily proof-reads this post) It speaks to attention to detail. Tip #19 : If you design clothing/selling, include a picture of the outfit in your “packaging”…. 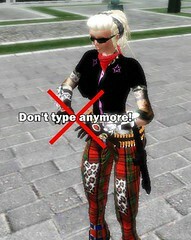 Tip #20 : If you are taking pictures please please do not use the “standard” SL Avatars. They are ugly! People want to look how your pictures does, I can’t tell you how many times I’ve seen great products be passed by because the person used what looks like a 1 day old newbie to take a picture. If your avatar isn’t “model” quality look someone up. IM people in certain groups, offer them a free copy of the item they are modeling, if you can’t afford to pay them. There are countless people that will model for you. It will make your picture so much better. All the credits goes to the SLEx forum members contributors: Kalley Koala, Neb Soyer, Sabrina Doolittle, Adriana Caligari, Becky Nosferatu, Sami Tabla, delicious demar, Bunnee Varmint, Cape Weary from the Original SLExchange Forum Thread. If you find really annoying seeing hundres of people chatting and making those typing sounds and animations like you are typing in the air, and seeing yourself being like a noob or even you wanna hide when you are typing to someone else, I have a solution for you. You need first set up your debugger settings (Pressing ctrl + Alt + D at same time) and it will appear two new menus: Client and Server. Now you just need to set up in your Client Menu > Debug Settings Option. It will open up a window with a dropdown menu. Go look on the list for the “playtypinganim” and next you put on False mode on dropdown below. Now it’s done! You won’t never hear yourself typing and writing at nowhere like a noob. OBS: It will only work for your avatar. You will still hear other people typing and seeing their animations, unless you ask them read this little tutorial and make everyone happy at the end.